It’s even clearer now. The FY 2017 budget won’t work, which means mid fiscal year budget cuts are ahead. And those budget cuts must be taken from a set of expenditures already squeezed down and chopped up. New information allows an update of the official version of the FY 2017 budget. We now know the actual beginning balance—$37 million—that carried over from FY 2016. We also now know the amount of FY 2016 unpaid bills—$87 million—forwarded for payment in FY 2017. The ending balance will be barely positive IF the sale of the bioscience authority brings in $48 million. That’s not likely. And the ending balance will be barely positive IF revenue comes in as projected. However, three months into the fiscal year, general fund tax receipts are already $67 million below projections. July tax revenue missed projections by $13 million, August missed by $10 million, and September missed by $44 million. The updated FY 2017 general fund profile shown above does not yet account for those misses. In early November, the FY 2017 revenue estimate will be revised—revised downward—and then the general fund will be “officially” underwater, triggering the necessity for more budget cuts. 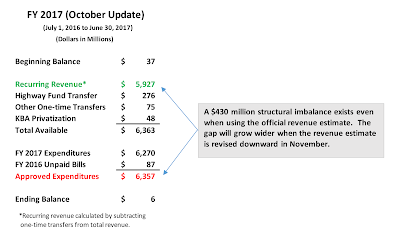 Given actual experience in the first 3 months of FY 2017, the revised revenue estimate could potentially be $200 million (or more) lower than the current one. Kansas does not receive nearly enough revenue to pay its bills, but that’s not a new phenomenon. The budget became structurally unbalanced four years ago, immediately after the implementation of unaffordable income tax cuts. Make no mistake. Kansas’ current troubled finances originate right there. 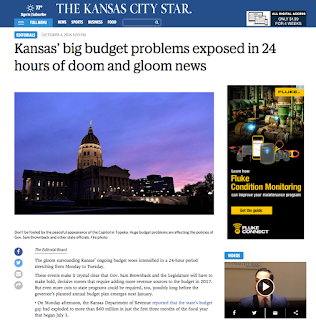 —This entry was originally posted on the Kansas Center for Economic Growth website. Who Benefited for the Kansas Tax Cuts?